Syria adorned with ancient and classical architectural sites; hospitality is a keystone of Syrian life, add the fact that Syrians have a talent for business and the boom in boutique hotels across the country makes complete sense. 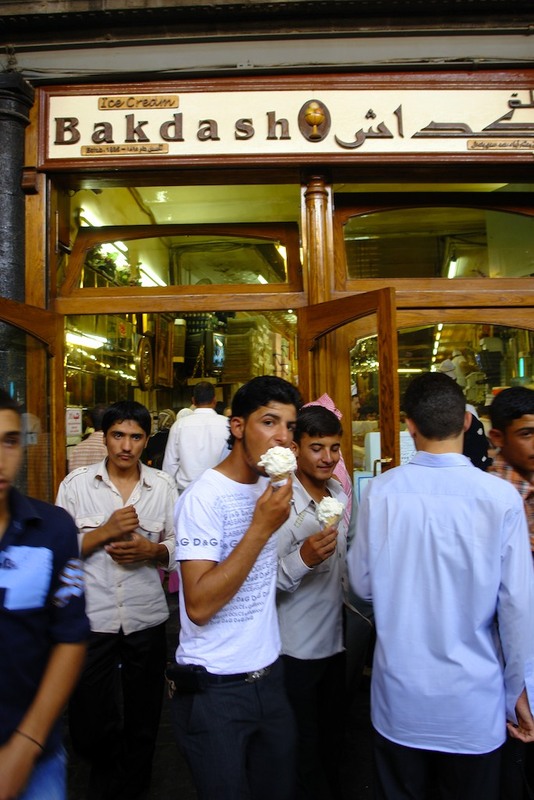 So it is not surprising that Syrians have responded to their natural tendencies in business and hospitality to restore rather than destroy century-old homes and protect their cultural heritage. 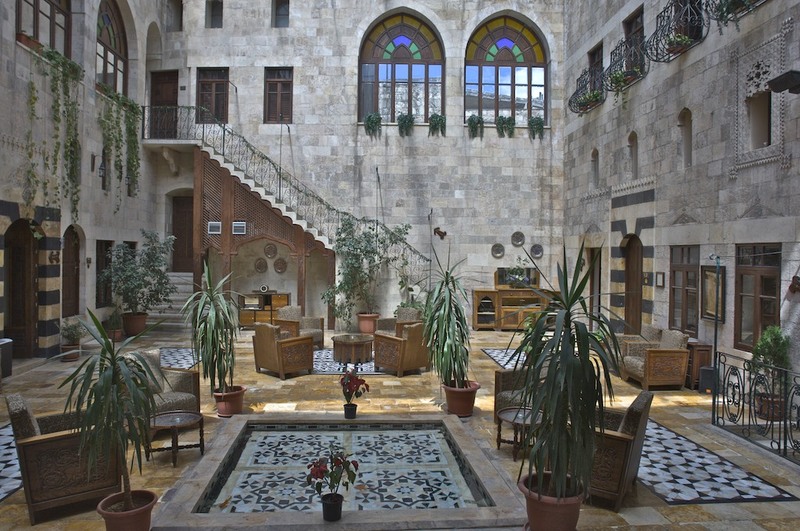 Visitors to Aleppo and Damascus looking to stay in a boutique hotel have a variety of 16th-18th century, courtyard Arab houses and palaces to choose from. Syria’s northern, desert port, Aleppo, located midway between the Mediterranean and Euphrates River. Aleppo was the northern trade capital of the ancient world’s trade. Today, Aleppo is renowned for its bazaar, towering citadel, and the best cuisine in all the Middle East and it is here that momentum for boutique hotels all began. Early in the twentieth century when western travelers ventured to Syria, traveling to the Mediterranean region by the Orient and Taurus Express, many stayed at the most luxurious establishment of its time, the Baron Hotel. In the latter half of the nineteenth century, Krikor Baron Mazloumian decided to open a hotel in Aleppo after his return from a pilgrimage to Jerusalem. He named the hotel after Mount Ararat in Armenia. The Baron had two sons who opened other hotels and in 1911, they merged to form the Baron Hotel. Every room is heavily perfumed in nostalgia, with posters of the Simplon Orient Express to Baghdad still in the hallway. Its guest book is a museum piece with notables such as Gamal Abdel Nasser, King Faysal, Gertrude Bell, Theodor Roosevelt, Amelia Earhart, Charles de Gaulle, and T.E. Lawrence. 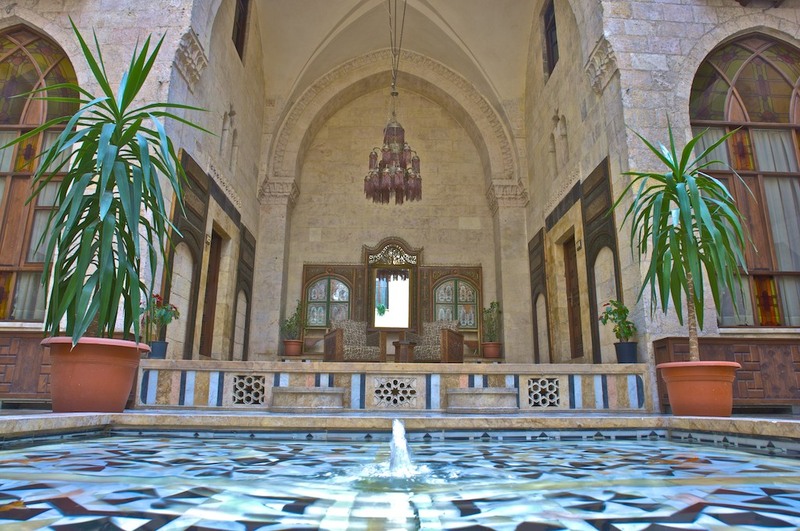 Though the grand old tradition of Baron Hotel may not qualify as a boutique hotel, one hundred years later, notable figures stay not far away in the most elegant boutique hotel in Syria, the Mansouriya Palace. Walking through the medieval gateway, Bab Qinnisrin, in Aleppo’s old quarters, one might think that direction given to this palace were wrong. The alleyways diverge. There is no signage. Only by inquiry is a dimly-lit, narrow passageway located leading to a humble metal-studded door. Leaving the twenty-first century outside the thick city walls, enter into the Mansouriya, a 16thcentury white stone palace. A small entryway opens onto an inner courtyard called sahn, with central pool and shaded with bitter orange trees and lined with sweet basil. Facing the courtyard is a large iwan (or estrade) used as an outdoor living room in the summer. The temperature of the courtyard keeps the rooms that surround the courtyard at a relatively even temperature. Across from theiwan is a doomed, ornate reception room that is decorated with colored-marble masonry and particularly fine painted and gilded woodwork. Each panel represents flowers and fruit grown in Aleppo, the antithesis of the barren desert. Nine suites and bathrooms have themes according to each era of Syrian history. The Greco-Roman room is painted in royal hues with frescos and marble statues while the Byzantine Suite is rich in brocade silks and hand-painted ceiling and the Iznik Suite is awash in the beautiful blue and green tiles. 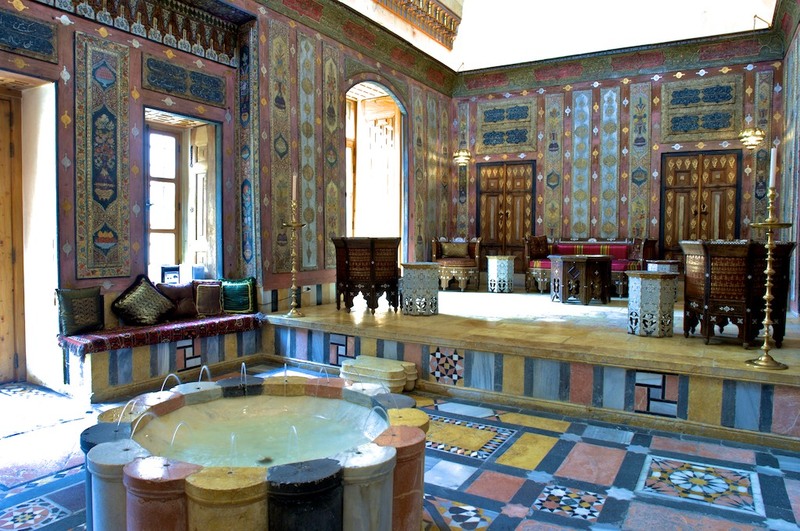 If lounging like royalty is not enough, the Mansouriya has its own spa with Turkish hammam inlaid with Iznik tiles. 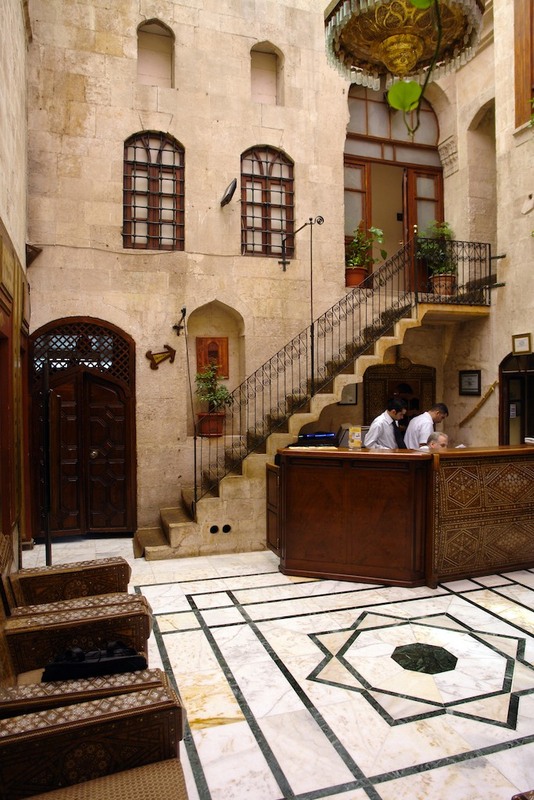 Aleppo was the first to open boutique hotels, Beit Wakil and Dar Zamaria, in the 1990s. The traditional houses of Jdaydeh neighborhood line a labyrinth of alleyways. Behind high-walled, windowless exterior, designed to secure the inhabitants from heat, noise, and dust, a small entrance leads onto a spacious, sundrenched garden and marble fountains, with elevated iwan and chambers around all sides. On all sides of the iwan and in the upstairs areas, geometric designs and poetic, Koranic verses, or maxims fill the walls of the rooms overlooking the courtyard. It is an exotic and evocative experience. colored marble floors, and superb arabesque woodwork. 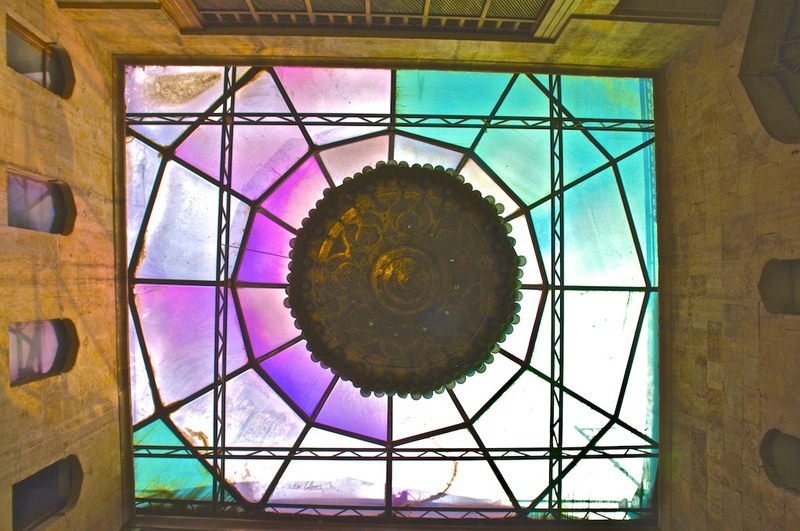 In the central reception (qaa), the wooden ceilings with cornices surround a suspended dome with colored arabesque glass. 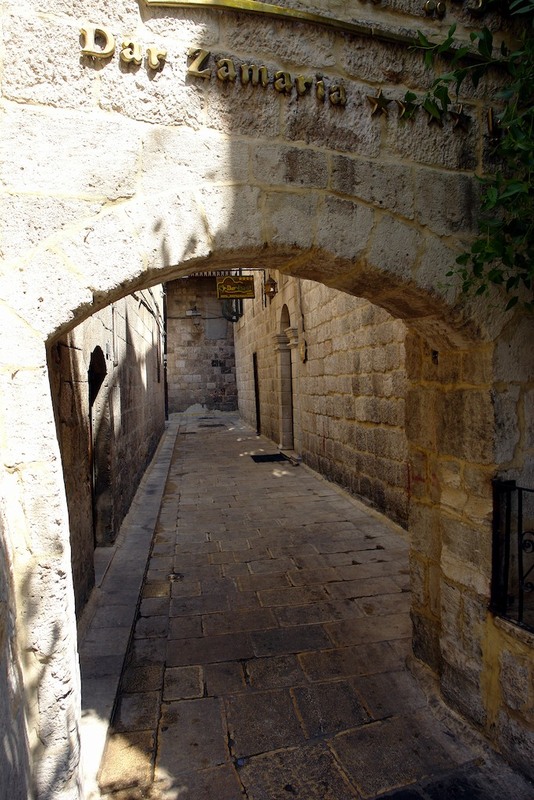 Cellars form a maze of tunnels, one of which connects to the Citadel of Aleppo. 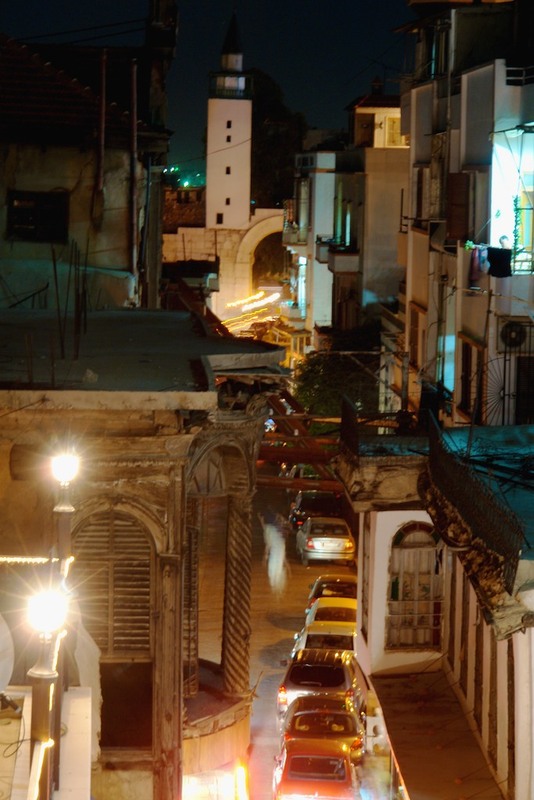 Nearby, Dar Zamaria , the first Arabic printing house established in 1705, opened its doors as a boutique hotel in 1997. 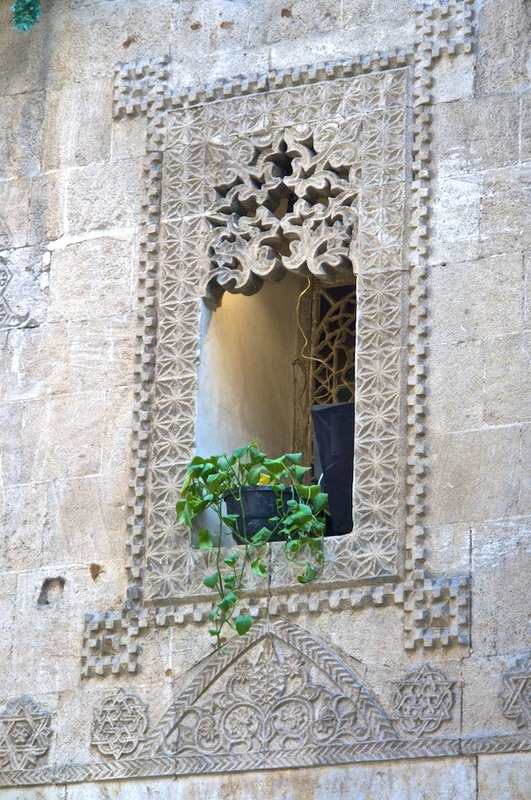 Neighborhood courtyard houses were bridged with the “Dar” to create three secluded gardens and decorated iwan. 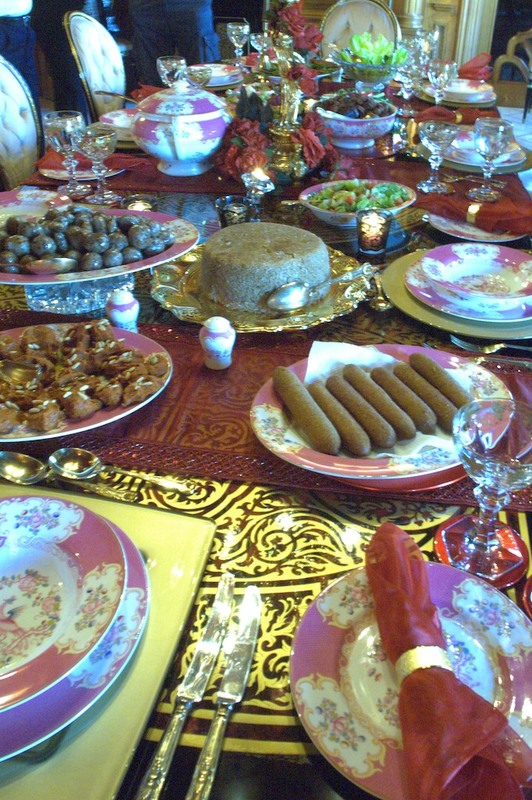 The restaurant has a superior breakfast of fooul, zataar, olives, omelet, and homemade apricot and cherry preserves – fit for a sultan. it dates back to the 17thcentury with original stone features and a 230 year old Christian fresco on the ceiling of one of the eight bedrooms. 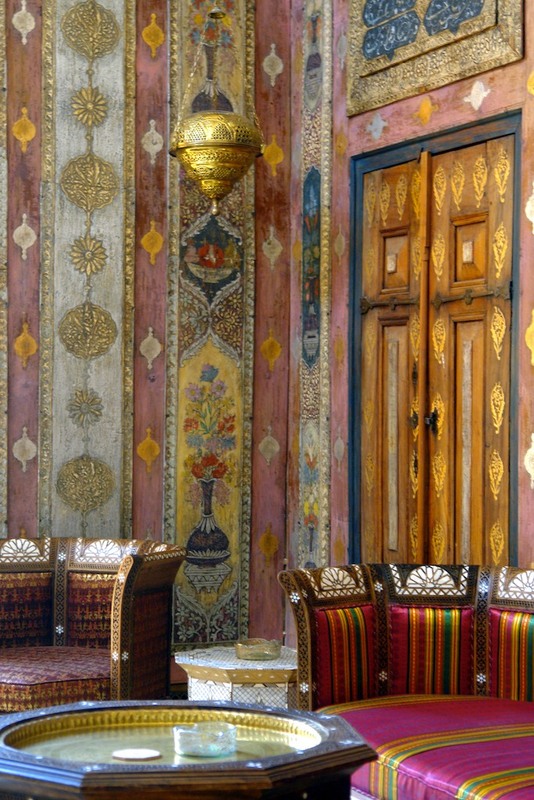 The rooms are decorated in traditional Arab styles using local Syrian products. 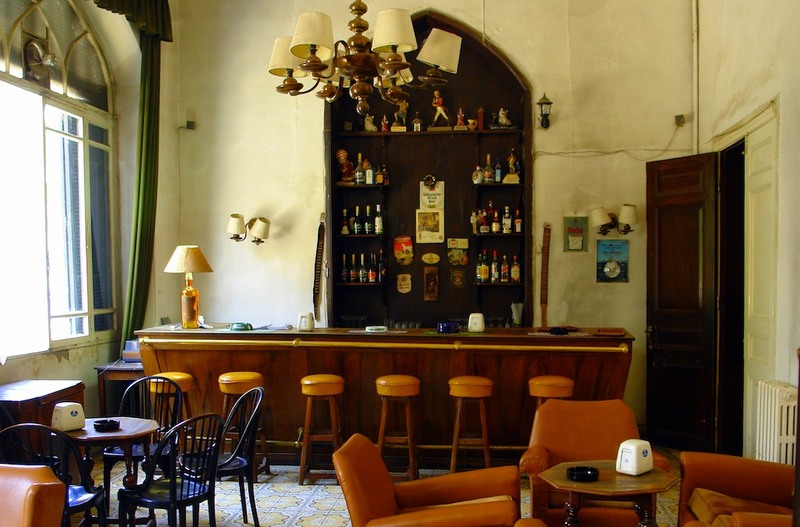 In August 2008, Beit Zaman became the most recent boutique hotel to open its doors. This 28-room boutique establishment took five years to restore and connect three 17th century family homes. Tranquility abound sitting in the citrus tree-lined courtyards has 300 year old fountains and geometric-colored marble cover the ground. 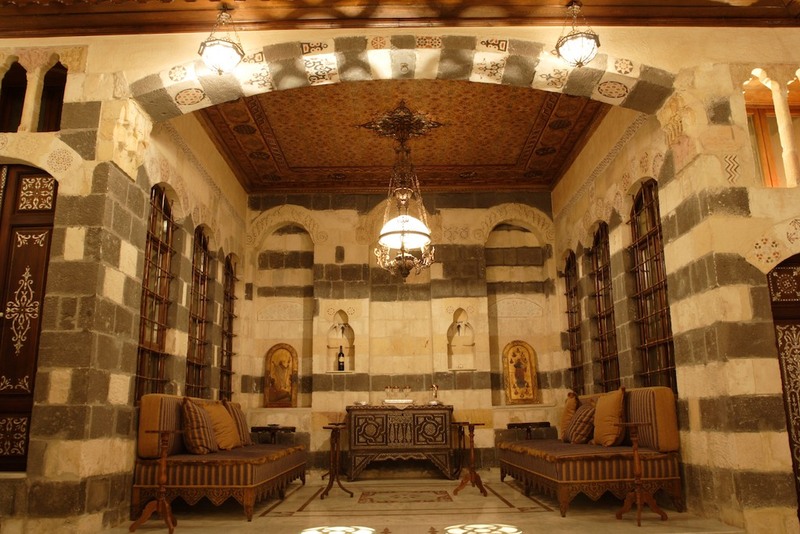 Each room is decorated with traditional Syrian furniture, inlaid wood with mother-of-pearl, and hand-made floor tiles. Locally-owned, Beit Rumman (the House of Pomegranate), is an intimate, beautifully restored 17th century authentic house, located in the heart of the Christian quarter. The proprietors bought the house in 1998 as a family home. They delved into the research of oriental architecture, visited a number of rich Damascene houses in the Christian, Jewish and Muslim quarters of Damascus old city in order to study the original decorations. 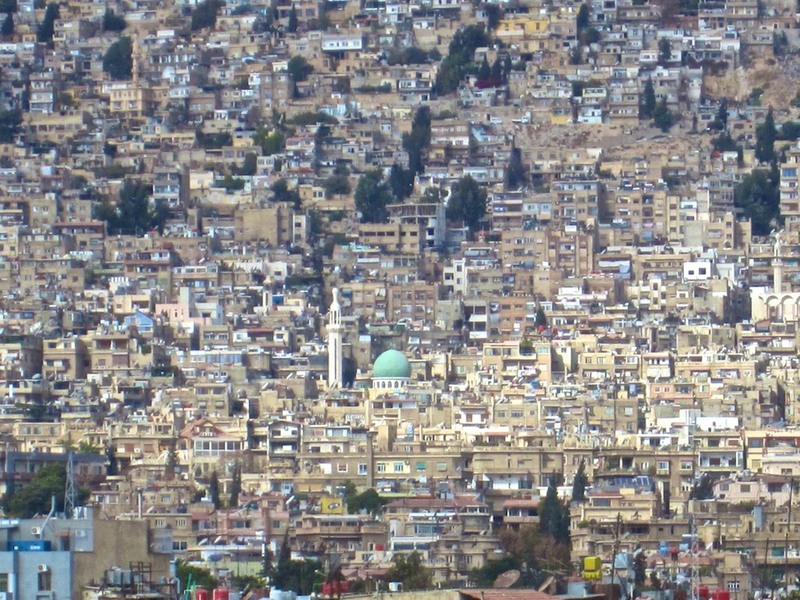 Traditional housing in Damascus is positioned from north to south in a twenty degree angle toward the West. This allows the stones to absorb the southern sun and avoid the northwesterly winds. The house was built between 1850-1912 and was brought back to life by its new owners and lovingly coxed back to its former glory over five year. The result is an exquisite showcase of traditional Damascene craftsmanship and architecture, giving visitors an insight into the Syrian life of old. 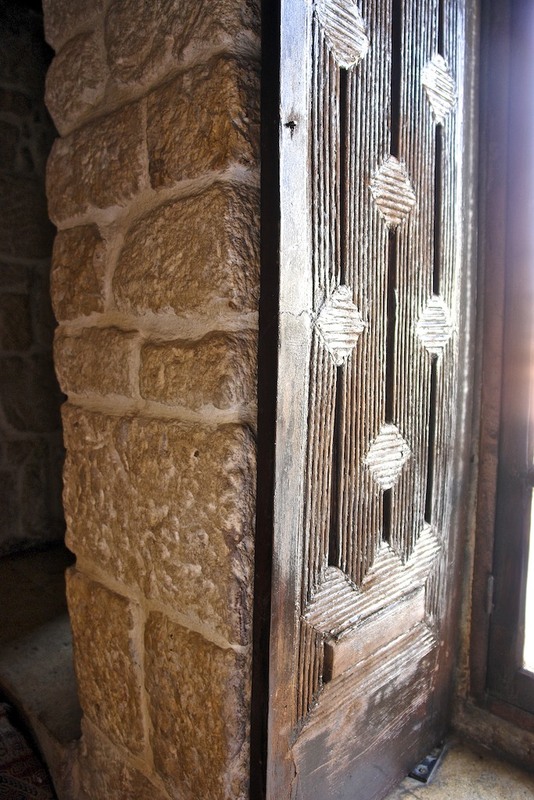 The owners, Rumman Family, said their goal was to restore, rather than renovate, the property, preserving its historical importance of the house as an example of Damascus’ heritage. 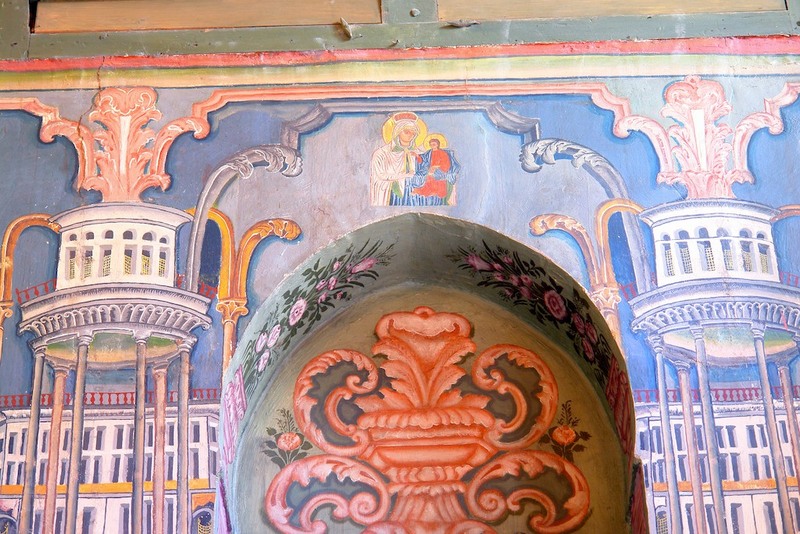 It did not take craftsmen working on the project long to discover a number of hidden treasures. Under layers of cement and paint lay riches such as delicate stone mosaic and ablaq masonry, a technique traditional to Syria in which alternating bands of light and dark stone (in this case white, black and yellow) are used. Every part of the house as well as insisting the house be completely environmentally-friendly, solar panels provides electricity and a water-wheel filters water. The priority at Beit Rumman is for guests to experience Syrian hospitality at this petite, six bedroom gem. The owners extend their love for Damascus to their guests. 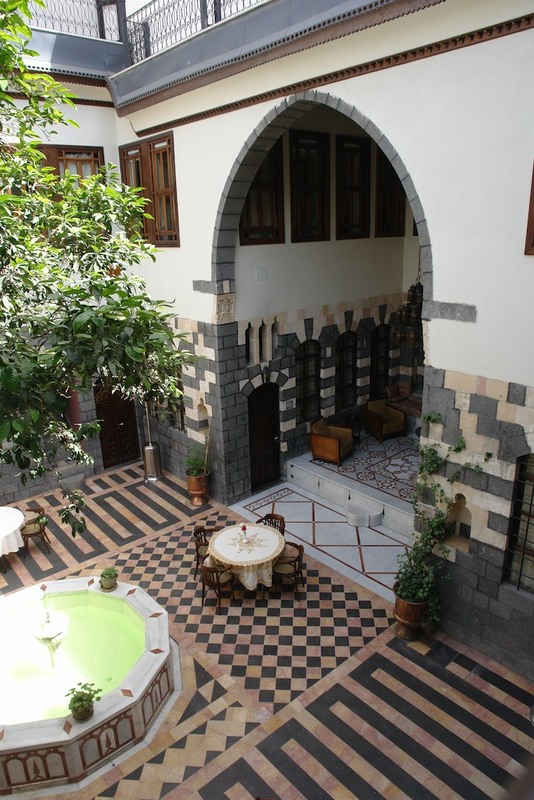 Ghimar Deeb, one of the owners adds, “If Old Damascus was a woman, I would marry her.” As the massive wooden doors open onto the central courtyard, horizontal stripes called ablaq define the windows, doors, in-laid stone and arches. The colored stripes surround the iwan symbolize concentric circles of life that link to heaven through the center point of the pool and fountain. These decorative elements shape the splendor of the atmosphere and reflect the efforts of the owner to display the serenity of this Damascene boutique hotel. 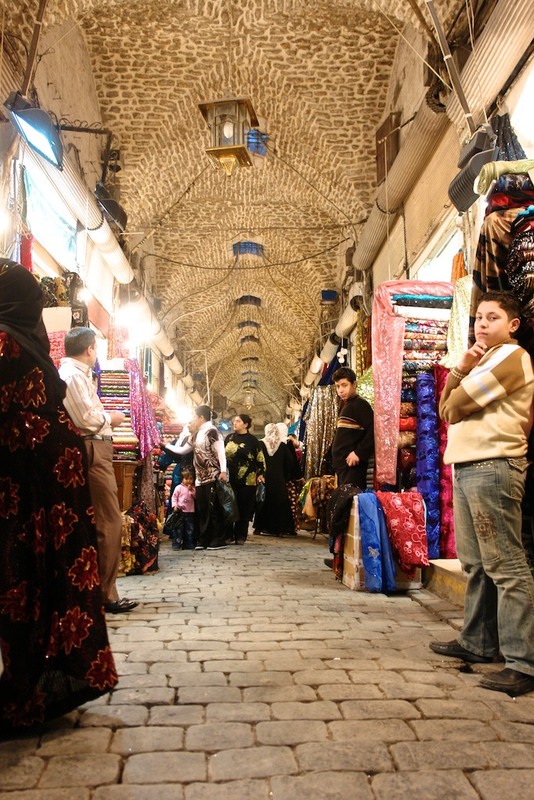 Winding from Bab Touma onto the Straight Street, a 1500 meter thoroughfare lined with shops, to the heart of Old Damascus, boutique hotels are numerous as the restaurants tucked behind high stone walls. One such establishment is Beit Jabri, built in 1737. The mezze – a variety of delicacies – is a gastronomical refinement like the spicy muhammara – a dip of chopped walnuts and red pepper. Tender grilled lamb and succulent chicken to follow, and if there is still an appetite, fresh sweet fruit, qatayif, and strong tea complete a perfect meal. But if a stroll and snack is preferable, walk through the Jewish quarter where, in recent years, the area emerged as an artistic hub and sip fresh mulberry juice. Visit the spice market but do not leave Souk el-Hamadiyyah without stopping for bouza arabiyyah at Bakdash. This one and only ice cream parlor was established in 1890 and is always crowded. 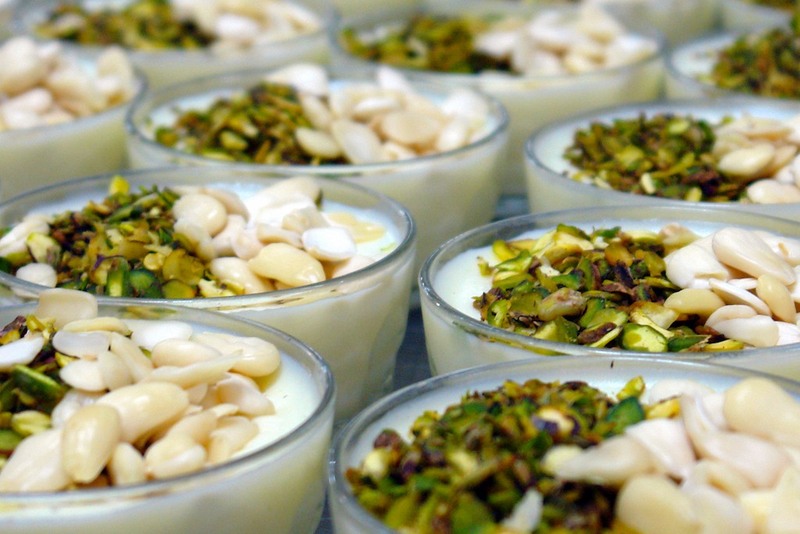 A trip to Damascus for this heavenly rosewater flavored (egg-free) ice cream, which is beaten by hand and topped with fresh pistachio nuts, is what sweet dreams are made of. 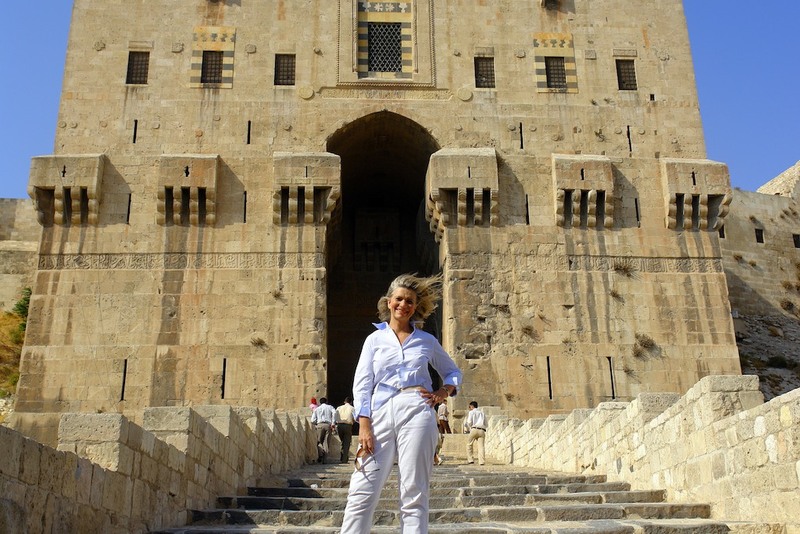 One of the oldest continuously inhabited cities in the world, Aleppo has long contained Syria’s architectural and urban history, boasting monuments and spaces from every period of the country. Ever since its historic core was inscribed on the UNESCO World Heritage List in 1986, Aleppo became a showcase for successful preservation projects. 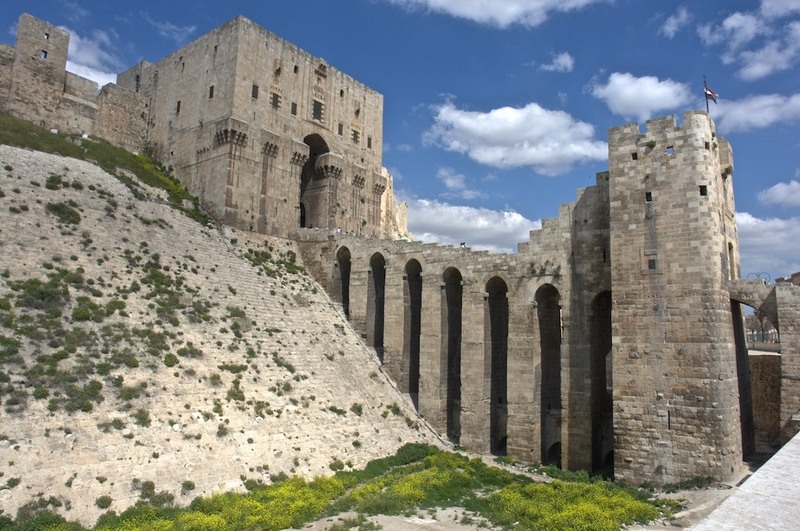 In 2008, the Aga Khan Trust for Culture in coordination with the Syrian Department of Antiquities completed restoration work at the iconic Citadel, famously fortified in the 13th century by one of Saladin’s sons, and where archaeologists later found vestiges of millennia-old temples. However, the last five years have been the worst in Aleppo’s long history, with the city turned into a battleground between the Syrian army and various opposing groups. The citadel was returned to its military function and suffered untold damage. The open space facing the citadel’s Ayyubid entrance gate, that once served as a weekly market and a polo field for Mamluk horsemen, was devastated. Monuments around that space were also pulverized, including the Khusruwiyya Mosque and Madrasa complex, Aleppo’s first Ottoman-style mosque and one of the earliest works attributed to the great imperial architect Sinan. In late 2012, a fire devoured the fabled Souq al-Madina, the largest covered commercial space in the Islamic world, an architectural masterpiece as well as an energetic space for commerce, religion, study, and leisure. In April 2013, the medieval minaret of the Great Mosque of Aleppo collapsed due to shelling. 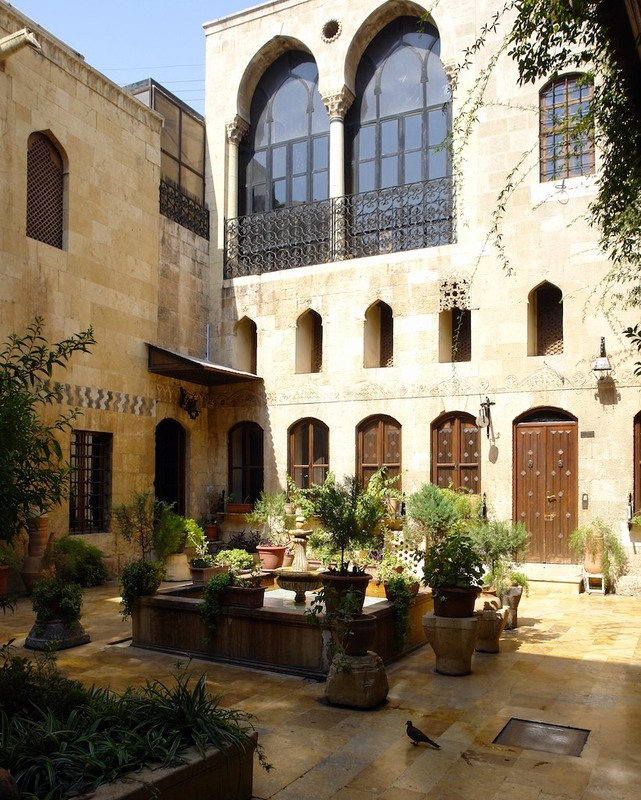 The war did not spare the churches of Aleppo, including the Forty Martyrs Armenian Church, whose courtyard once sheltered survivors of the Armenian Genocide. However important they are architecturally, the before-and-after photographs of the shattered monuments tell more than the collapse of old stones. They are shorthand for the destruction of the infrastructure of Syria’s largest city, the collapse of its vibrant economy and centuries-old commercial traditions. Most important of all, however, the destruction of this heritage stands for the utter destruction of Aleppo’s social fabric, one of the most diverse in the Arab world. The war has killed thousands, and displaced thousands more. It has destroyed a city where you could speak and write in Arabic, Turkish, Kurdish, Armenian, Assyrian, even Russian, where you could celebrate every obscure Eastern Christian holiday, where you could pay homage to high places of Sunni Islam just as you could visit sites special to Shiite tradition, a city suffused with the baraka (blessings) of Sufi shrines and apparitions of the Virgin Mary. A city, too, that maintained unique aspects of intangible cultural heritage like traditional music and cooking cultures, that boasted one of the earliest surviving coffeehouses in the Islamic world. In the last five years, the city called Halab al-Shahba’ (Aleppo the Gray) for the color of its stone architecture—young and vibrant for millennia—has become gray and faceless. The Umayyad Mosque in Aleppo caught fire during fighting over the weekend. New Video released in December 2016 shows ancient Aleppo totally destroyed. I do not know the author of this video. Note the Russian and Syrian national (Assad) flags. The commentator is talking about the various building destroyed including a mosque which he questions, why destroy the house of God? All your beautiful photographs! Now sad beyond words! I went through photos I took in Syria from 2007-2010. So sad to see the culture, society, heritage and life so damaged in eighteen months. Thank you for sharing your pictures and memories of Syria. The destruction of all the historic places and the needless loss of life, will be what we think of today. Is there ever going to be an end to the problems? I will remember them in my prayers. This destruction demonstrates the worst traits in human nature. It seems that no matter how civilized “we” think we are, hatred, violence and wars stripes us naked.